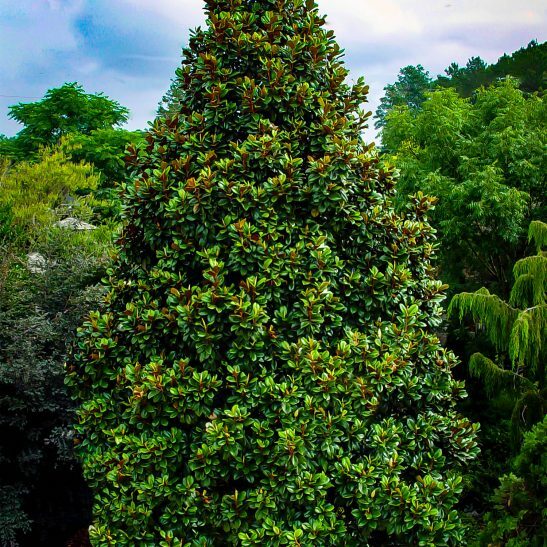 The Teddy Bear® Southern Magnolia is a fast-growing upright form of the Southern Magnolia, with all the great features of that popular and iconic evergreen, but on a much smaller, densely-branched pyramidal tree. 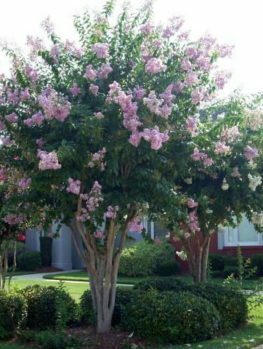 This smaller tree grows rapidly to about 25 feet, and so it is very suitable for smaller gardens, screens, avenues and specimens, as well as growing in large planters and containers for many years. Its foliage is even richer and deeper in color than the regular tree, and with the typical dense brown ‘fur’ back to the leaves. 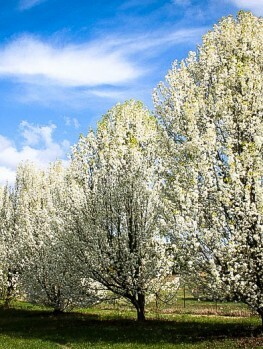 The richly-perfumed pure-white flowers first appear in early summer and continue into October. 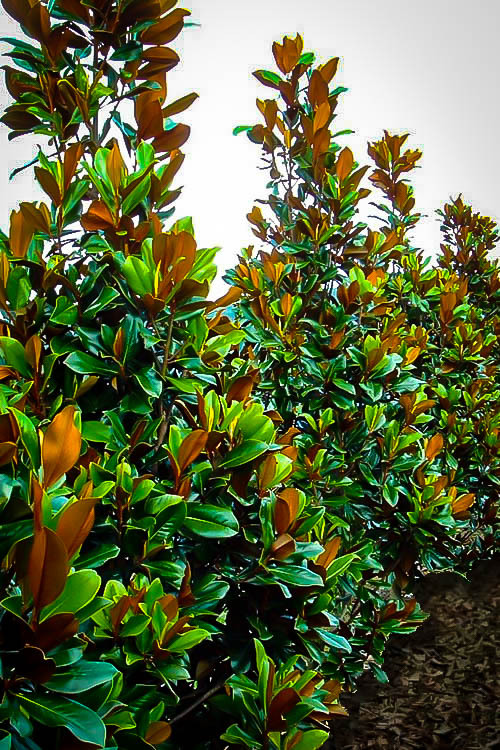 The Teddy Bear® Southern Magnolia will grow in almost any type of soil, and once established it is drought-resistant too. It is also tolerant of salt-spray, making it ideal for coastal gardens. Its dense habit makes trimming unnecessary, and it is rarely bothered by pests or diseases. It grows best in full sun or partial shade, and benefits from mulching with rich organic material regularly. At the limits of its cold hardiness, grow up against a south-facing wall for protection. The Southern Magnolia is a wonderful evergreen tree to grow in warmer parts of the country, and it is greatly loved for its rich, glossy green leaves all year, and the enormous pure-white flowers that appear all summer long. This tree is an American native tree, but it grows into a very large one, easily passing 50 feet tall in time, with record trees being over 100 feet tall. It also spreads out widely, so you need a large space to be able to grow one. Unless, that is, you choose the Teddy Bear® Southern Magnolia. This special form is much smaller, reaching no more than 25 feet tall, and staying just 10 or 12 feet wide. Due to its size, the Teddy Bear® Southern Magnolia fits perfectly into a much smaller space, and it can even be grown for years in a large pot or planter box. If you have a smaller garden – as so many are today – you can still enjoy the charm and beauty of a Southern Magnolia, with all its associations with hot southern summer days and mint juleps. Among evergreen trees, this is one with many virtues. Its dense evergreen foliage provides beautiful screening, it shades you home or patio, and it brings grace and elegance to every garden. 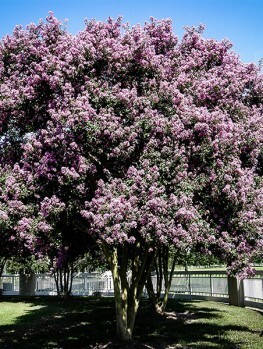 The Teddy Bear Southern Magnolia is perfect for a specimen tree in a smaller garden. It creates the perfect backdrop to other shrubs and flowering plants. 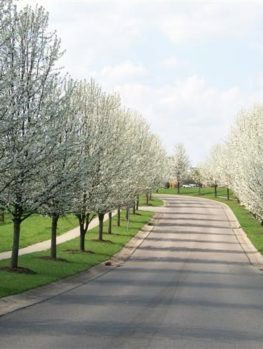 It also makes a wonderful avenue along a driveway, or a screen along a boundary. 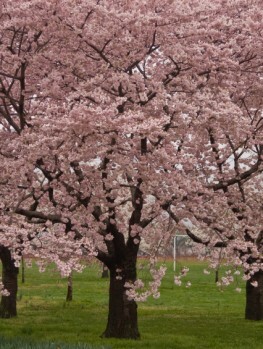 Plant it in rows, spacing the trees 8 to 20 feet apart, depending on how dense you want the effect to be. A wonderful way to grow it is in large tubs or planters, which you can place around a pool, or on the corners of a patio, or on other paved areas. It also has good resistance to salt spray, making it an excellent choice for a coastal garden. 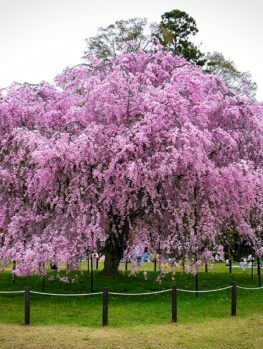 Unlike some other smaller forms, this tree is rapid-growing, so it quickly develops a mature habit and should begin flowering within a year or two of planting. If you are in the colder parts of zone 7, or perhaps in warm parts of zone 6, you can take a page from the book of English gardeners. They plant it at the base of a sunny wall of a house, and tie the branches into the wall as it grows, so that all of the plant receives plenty of sun, and is sheltered from cold by the warmth of the house. This way they thrive and flower even in colder areas. 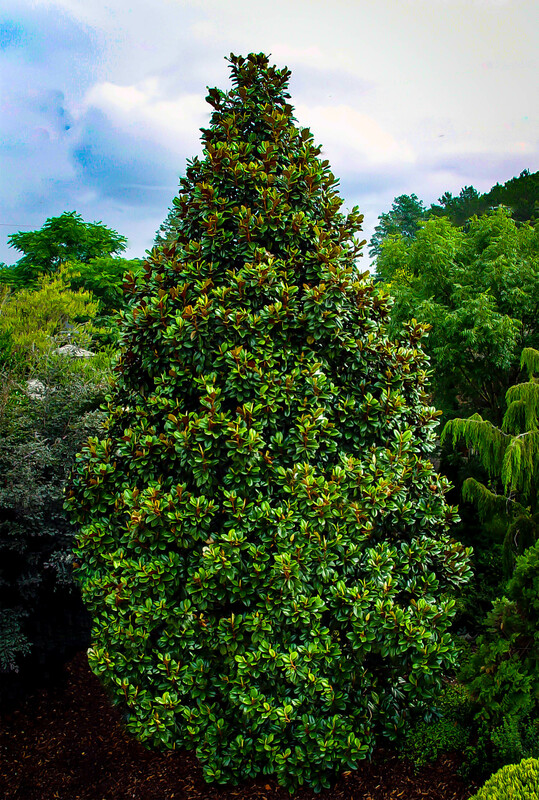 The Teddy Bear Southern Magnolia has an upright, conical form with dense branching, so it has a rich, bushy appearance without any trimming being required. The side branches turn upwards, rather than spreading outwards, which is why this tree is so much narrower than the original species. The foliage is very dark green, and the leaves are 5 or 6 inches long, in a simple oval shape. Although the upper surface is green and glossy, the lower side is covered with a very thick, brown ‘fur’, which makes a very attractive contrast. It does indeed look just like the dense fur of a brown teddy bear. The bark of the tree is smooth and a light shade of gray, becoming darker and a little rougher as the tree matures. In May or June you will see the first flowers, and these are produced steadily for most of the summer. They are 5 to 6 inches across, and the thick, crystal-white petals open flat, showing a central spike of flower parts, and releasing a rich, heady perfume. In fall you may see unusual structures a little like pine cones on your tree. These are the seed pods, and in late winter you may see them open to reveal bright red seeds, which later fall to the ground. Choose a sunny or partially-shaded spot for your Teddy Bear Southern Magnolia. Especially in hot, drier gardens, some summer shade will be beneficial. This tree grows well in most types of soil, from sand to clay and from acidic to alkaline. 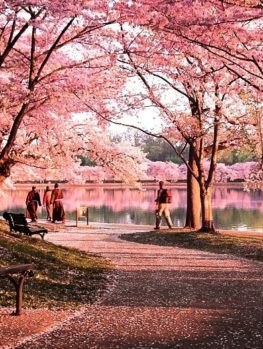 It thrives in soil with a high organic content, so add plenty of rich organic material when planting your tree, and mulch it each spring as well. Water regularly for the early years, but after that the tree is moderately resistant to drought. It has no significant pests or diseases. The Southern Magnolia (Magnolia grandiflora) grew wild in the forests of North Carolina down to Florida, and west to Texas. It can still be seen in natural areas, and it is a tree rich in connotations of southern living. 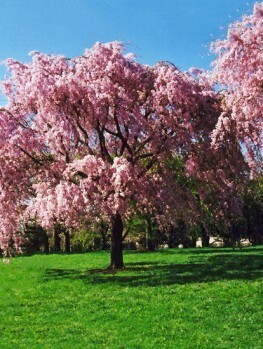 Many forms of this tree have been developed, and like all tree breeding, it is a long process. 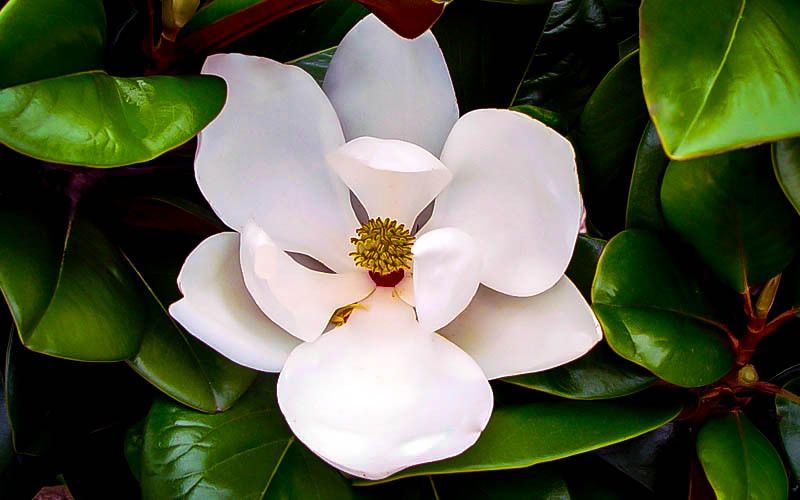 Back before 1980, Robert H, Head and members of his family at Head Ornamentals Inc. – a plant-breeding nursery in Seneca, South Carolina – collected some seeds from a cross between two forms of the Southern Magnolia. They grew the seedlings, and in 1985 chose one plant from among them, because of its unique characteristics. This tree was carefully grown and tested for the next 16 years, before an application to patent it was presented and accepted. It was the unique features of this plant, especially its dense, upright growth, and dwarf form combined with rapid growth, that made it unique and worthy of a patent. Our trees are produced under license from original stock of this very special plant, and they are exactly true to the description. There is always a high demand for smaller forms of Southern Magnolia, so order now while our limited stocks remain available.